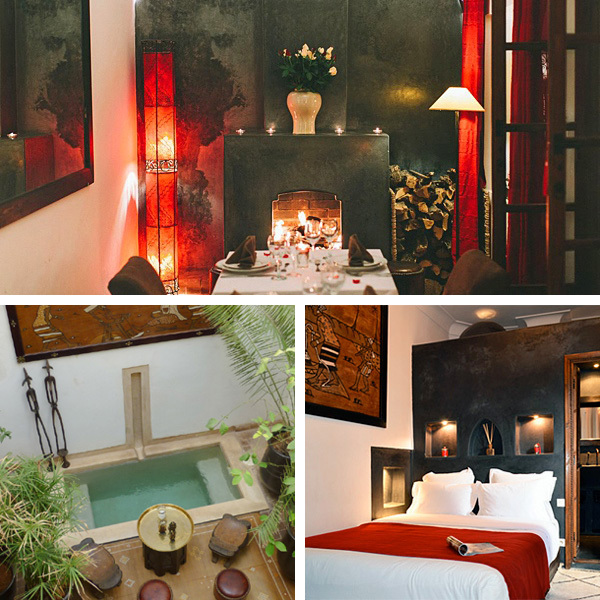 At first glance, Marrakech hotel Dar Zaman looks too good to be true. As the sun sets during dinner, the small riad lights up with the glow of candlelight, rose petals are sprinkled over beds, and the space is transformed into an achingly romantic haven. Better still, it does so at some of the best prices in the medina. Once you’ve negotiated the medina and been welcomed through the regal wooden door by owners Peter and Hassan, you’ll see that this pitch-perfect combination is no accident. The warm and attentive service will leave you feeling like you’re spending time with kind and knowledgable friends – and it’s just a 10-minute walk from the bustling main square, Djemaa el Fna. 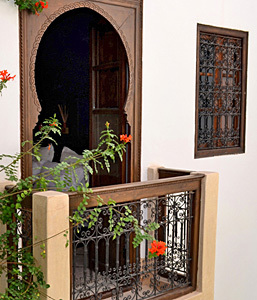 Rooms: With only 4 rooms, Dar Zaman feels very intimate. All rooms are equally charming, with no duff choices. 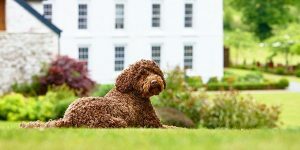 Three are on the first floor and look onto the courtyard, while the fourth sits on the roof terrace – ideal for sun-worshippers who don’t mind a slight loss of privacy. Each is decorated with stylish simplicity: walls come in neutral creams and whites, with rich splashes of red and burgundy in the bedspreads. 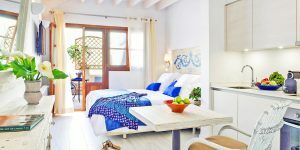 The furnishings are just as elegant: carved wooden lamps and bedside tables, soft Berber rugs on stone floors, and ornate shutters which block the light and allow for indulgent lie-ins. 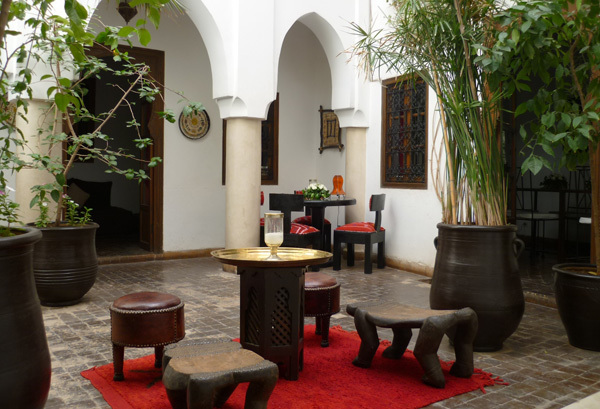 Food: As with many riad B&Bs, there are a number of picturesque spots to enjoy your breakfast. In the heat of mid-May we opted for the shaded dining room, but if you prefer you can head to the courtyard or soak up some sunshine on the roof terrace as you tuck into a spread of pastries, fresh pancakes, fruit and yoghurt. Order ahead and you can also enjoy a leisurely lunch or dinner. We loved the mouth-wateringly fresh tagines from chef Karima so much that we invited her to share a recipe on the blog! 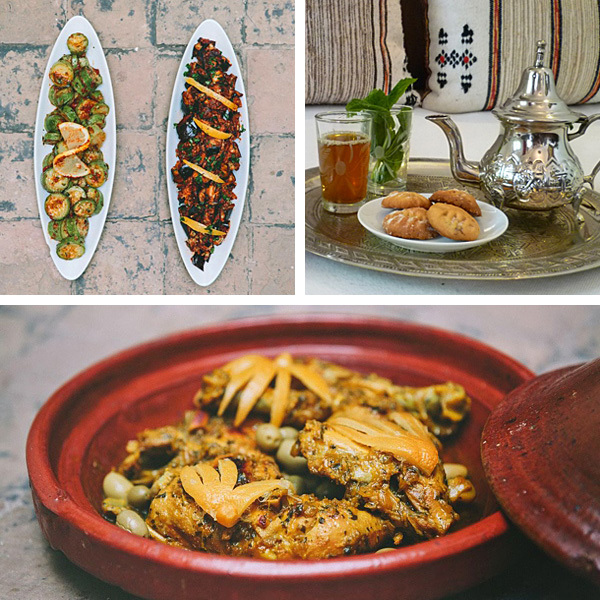 They’re made with market-sourced produce and served alongside restorative mint tea and rather good Moroccan wine. Author’s tip: We suggest you take up the hotel’s offer of borrowing a Moroccan mobile phone so that you can easily call them if you get lost. It’s free, and comes pre-charged with credit and useful numbers. 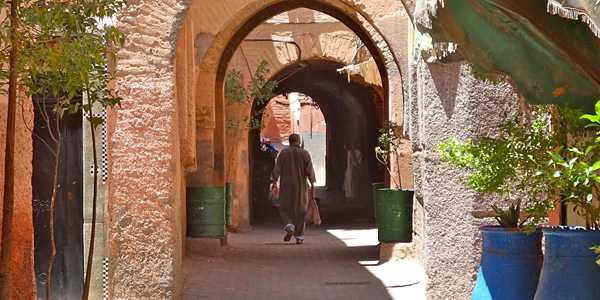 They can talk you back or come and collect you – one guest said that the ride to the riad on the back of Hassan’s motorbike was the highlight of their stay!